I’m in the throws of packing for Paducah and I’ll be bringing the “leftover” fabrics from the Something Blue Baskets Block Hop from Houston. I’ve got Fat Quarters and some yardage. Come by the booth early for best selection…when it is gone…it’s gone…and I don’t want you to miss out. 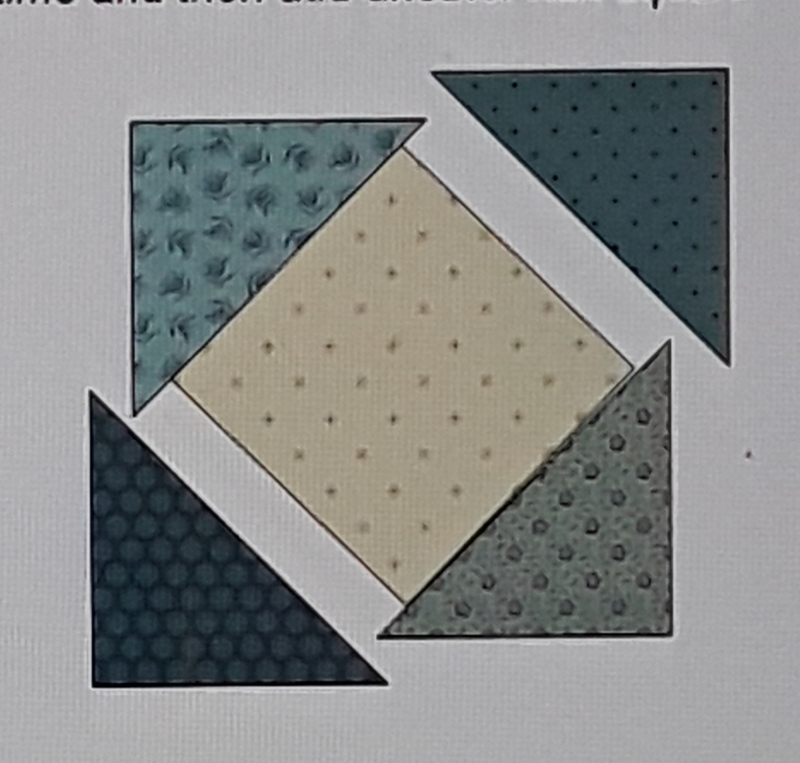 For those of you who participated in the Hop and bought my finishing kit, your pattern MAY have a TYPO. PLEASE!! 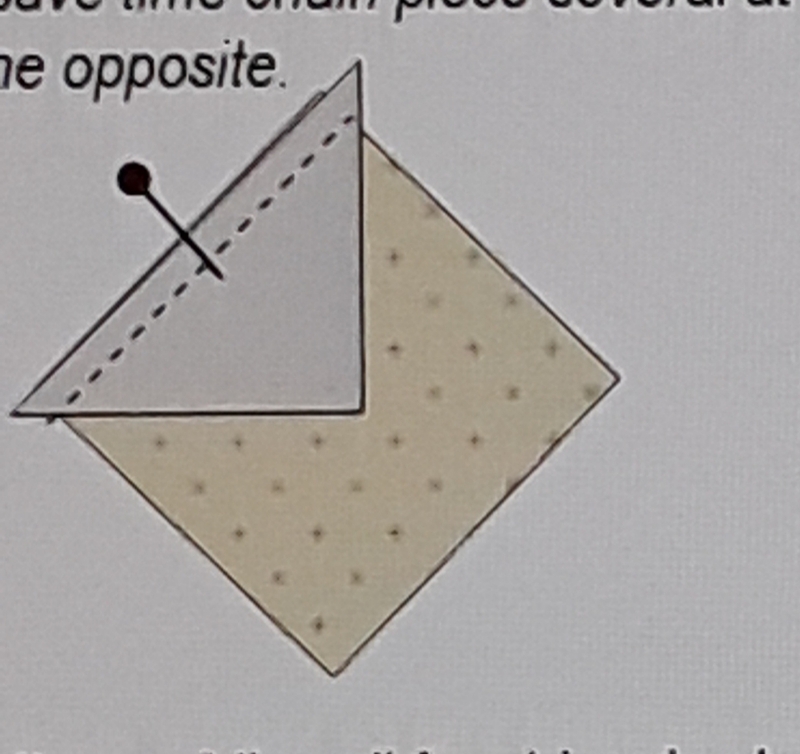 Double check the Square in a Square block measurement. It should read square to 4 3/4″ (not 3 1/2″) for their finished size of 4 1/4″. As many times as I read and re-read and check numbers sometimes changes miss in getting to the final printing. I apologize for any inconvenience this may cause. 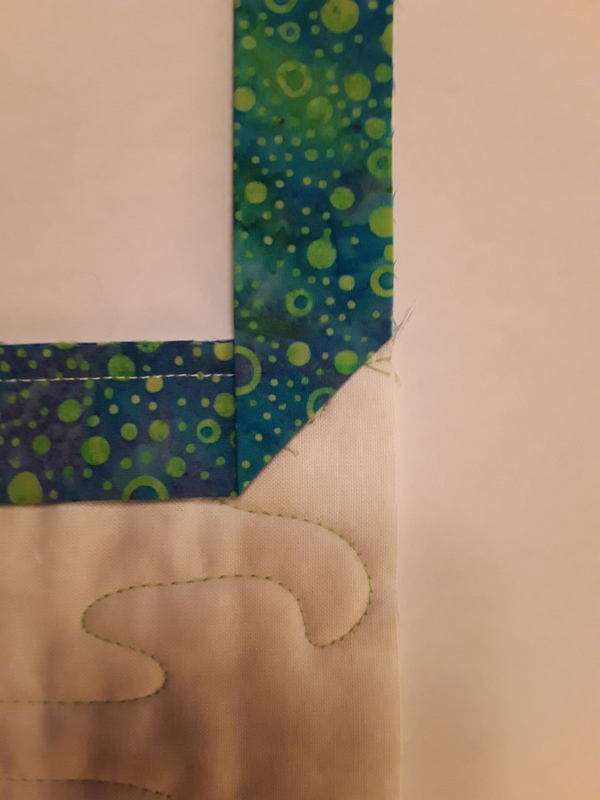 If you have cut smaller blocks, no problem, add more blocks in the strip to fill the length. #1 – Always mark center points on all pieces. Sq n Sq block pieces with center pins. 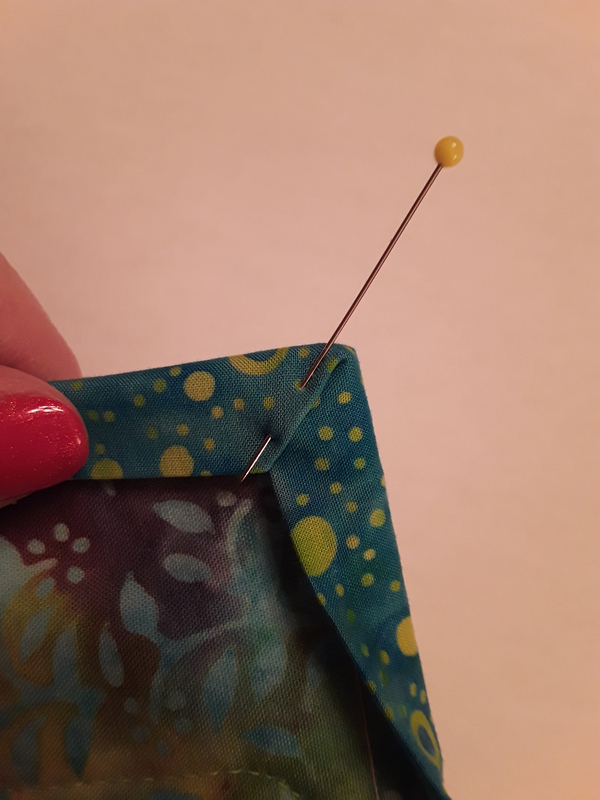 #2 – Align center points and stitch. Align center pins and sew. #3- Add half squares to opposite sides. Sq n Sq opposite edges sewn. 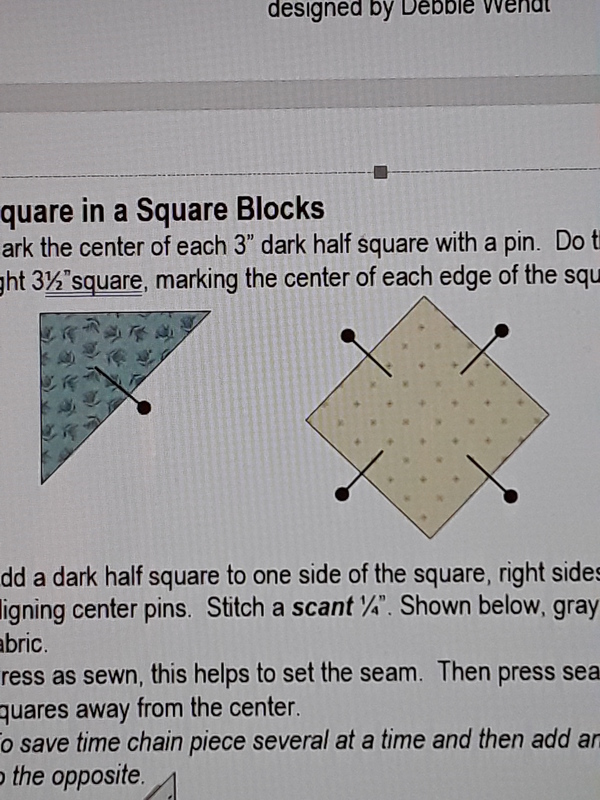 #4 – Add third and fourth half square to remaining opposite sides. I hope you are able to enjoy BLUE skies in your area! I also hope to see you in my booth next week in Paducah #2605! Some days look like this at the Wendt Quilting table! 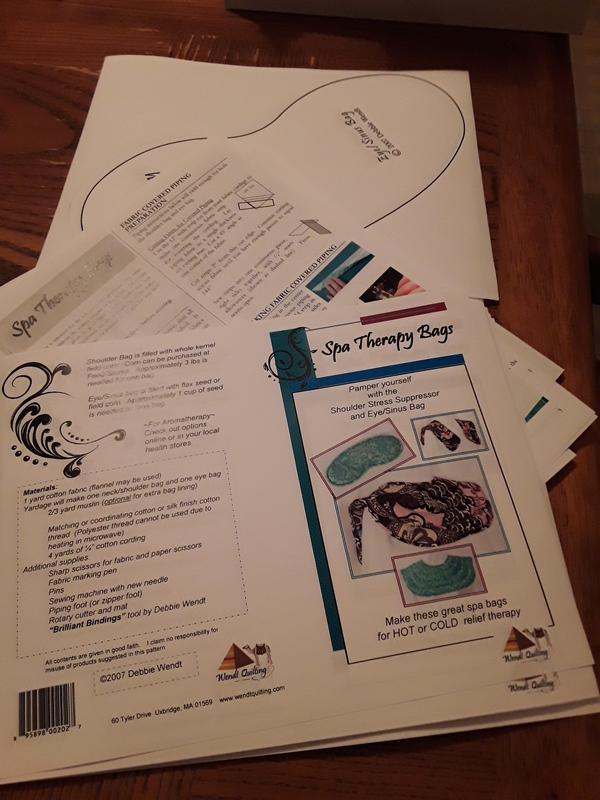 Spa Therapy Bag pattern D.W.
Spring Paducah is just around the corner and many patterns have to be folded and ready to vend. And kits assembled and ready for class! There are just a few seats left in Hexies and Honeycombs on Wednesday night from 5-8pm. Won’t you join me for fun evening of learning to English Paper Piece (EPP)? These are great “go” projects and don’t take up much room to carry at all. We’ll be making and exploring Flower Garden blocks and Lucy Boston’s Patchwork of the Crosses. You bring some 2 1/2″ squares and a few fat quarter and a kit supplies all your papers! A fun way to spend a few hours with like minded quilty people! Handwork is great for relaxing with friends. Years ago when I first started a flower garden quilt, NO it isn’t finished yet, but getting closer each time I travel. I love my plaid flowers! Did you know you can reuse the “Paper Pieces” papers? 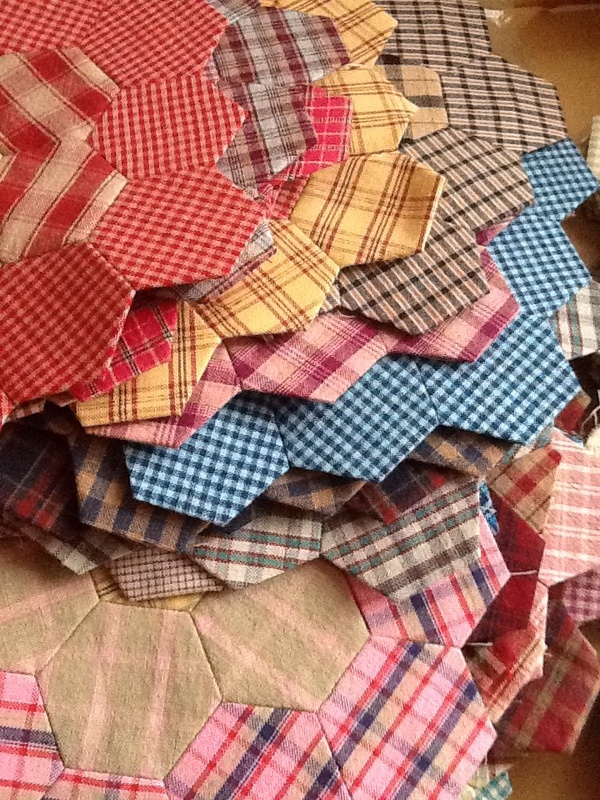 Once you get a hexie surrounded, you’re good to take out the paper for that center piece. The papers are very reasonable but by reusing you save some change and weight that you carry around. #1 – Reuse EPP “Paper Pieces”. #2 – Explore Honeycombs for a new handwork project! I hope you’ll join me in Paducah. And my booth has moved to the first floor of the Convention Center #2605 (not the main Expo hall, but down the hall and around the corner in the same building). See you there in 2 short weeks! A great week in Lancaster for AQS Quilt Week. (Yes, that is why I didn’t get a post done, busy setting up the booth!) It was good to meet so many like minded people, quilty people!! Thank you for visiting my booth, purchasing tools and patterns, attending the learning center Hexies demo, All-Star Review, World of Bindings lecture and Become a Brilliant Bindings class!! I had a blast and enjoyed sharing bits of my quilting passion with YOU!! An important topic that always gets questions and my attention is bindings and making perfect mitered corners. In demonstrating bindings there are some specific steps that help make those miters perfect. I’ll add photos below of key steps of the miter process. 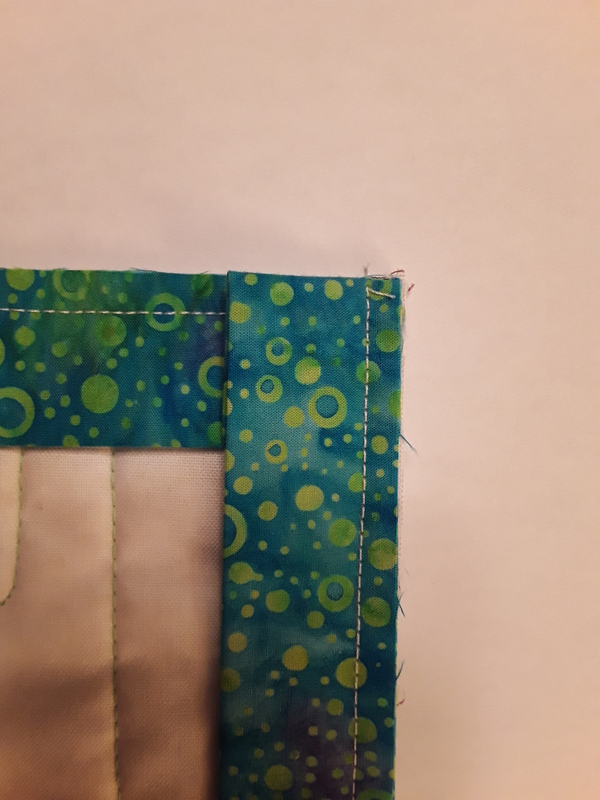 1 – Stop sewing the same distance from the upcoming edge as the seam width you are using. At the seam distance, leave needle in all layers, raise presser foot and stitch off into the corner. Stopping point and stitch to corner. 2 – Flip the binding back so the raw edge is in line with the upcoming side edge. 3 – Flop the binding on top of itself in the new direction, keeping all edges even. 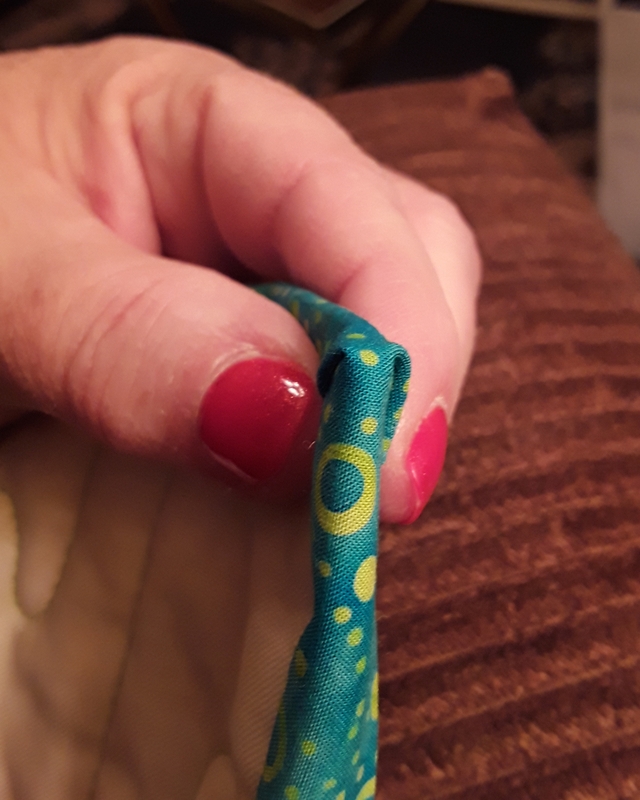 Tip- I call this the binding corner FLIP FLOP! 4- Sew down the new edge to the next corner and continue around the quilt. 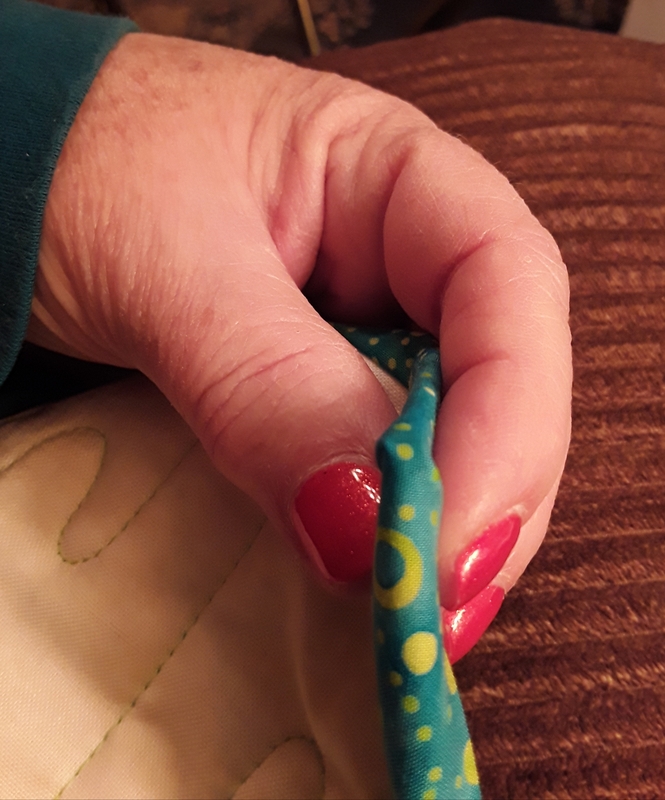 5 – Turn the binding over the corner to the back. Binding turned to the back. 6 – Whichever side of center has the fold on the front, that is the side that gets turned back first on the back. Miter on back of quilt. Tip- The folds should be on opposite sides from the front to the back. Tip- If you have “nostrils”, the folds are on the same side adding thickness to the miter and NOT what you want for your miters. I hope these tips make your miters perfect! I’ve got my full hexie quilt in the final stretch! 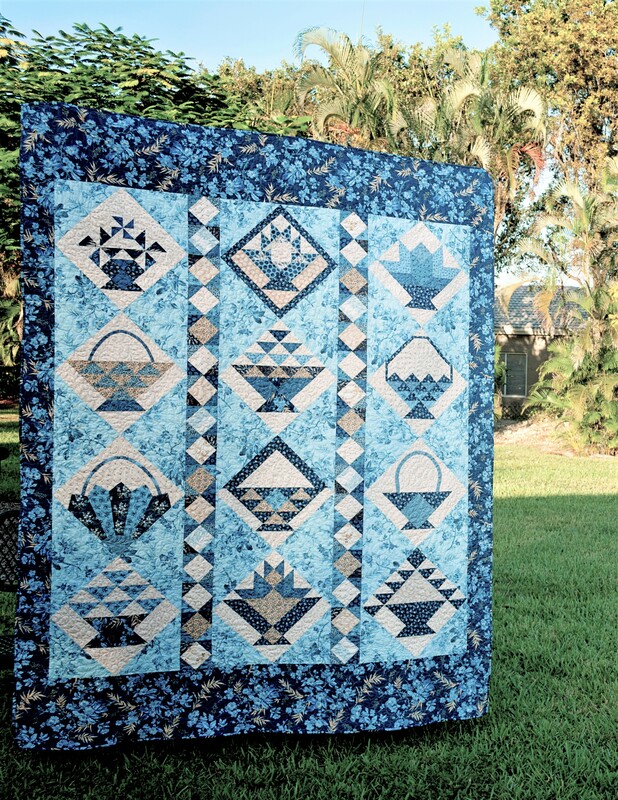 This quilt was made for a guild challenge…ugly fabric. I received the white dainty flower fabric on brown as my ugly. Not bad at all! But someone wanted it out of their stash and I gained a great fabric for making full hexies. All the other fabrics were pulled from my stash! The binding is all I have left, simple black will frame it nicely. 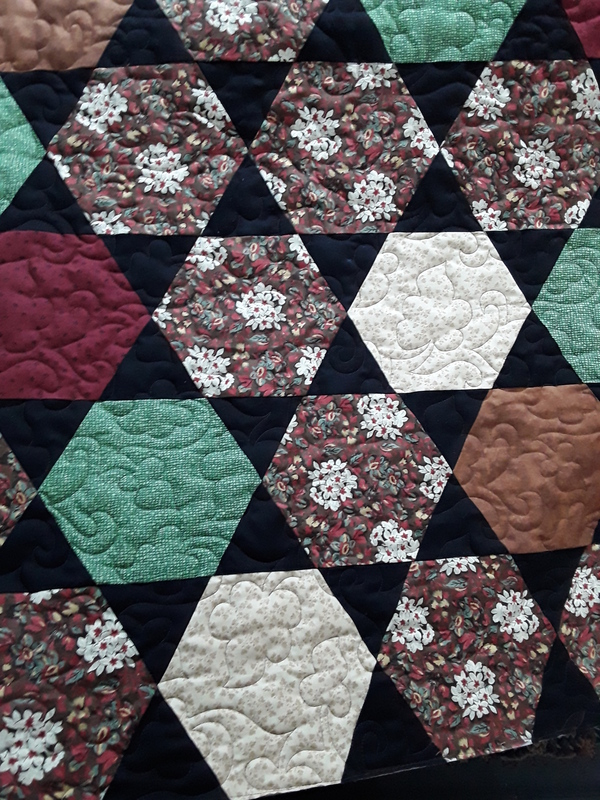 Partial view of Full Hexies Quilt D.W. I thought it might be too dark, but I like that it didn’t show up on the black. 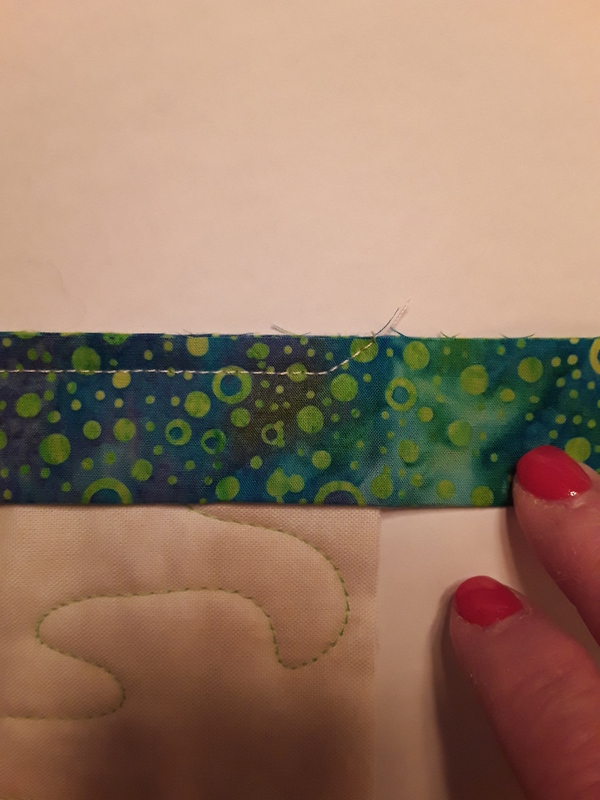 I puddled the thread over all the fabrics and decided it would work well. Here are a few close ups of how the dark brown quilted over all the colors. I was pleased!! 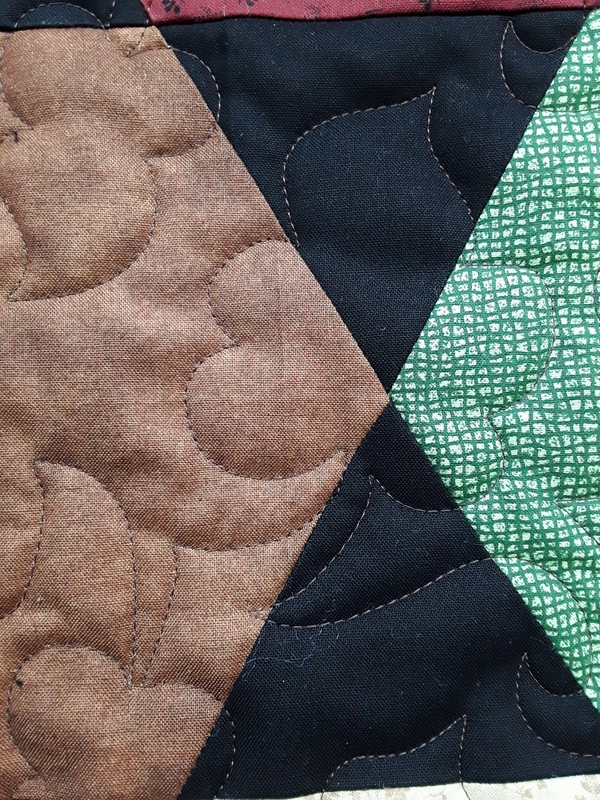 #2 – I prefer a dark thread quilted across light fabrics rather than a light thread across black on this quilt. I felt it blended better across the quilt. The thread is a 50 weight, “So Fine” by Superior Threads. Another quilt quilted and ready for my Learning Center lecture at the AQS Quilt Show in Lancaster, PA next week! Now to get the binding sewn on and hand stitched! Next week I’ll be setting up my booth in Lancaster, safe travels to those of you heading to the show. Come by my booth #1158 and hoping we don’t get the snow we got last year. It is NOT in the forecast! Speaking of weather…being from the Midwest, I have many family and friends and friend’s families in the areas of the horrific flooding along the Missouri River and most of Nebraska. It is into Iowa and now down into Missouri. If you would be so kind to keep them in your thoughts and prayers. My friend, who was raised on a farm said it best…These are the people who feed our country! P.S. 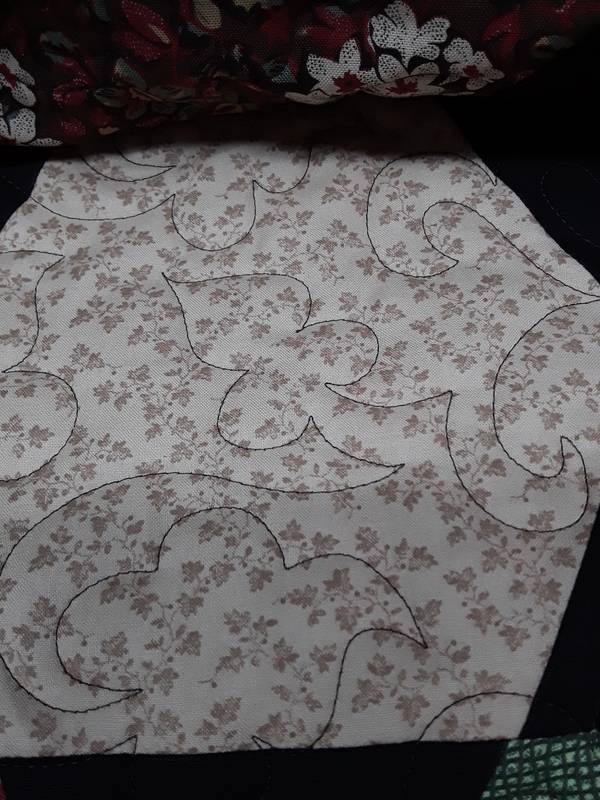 The pantograph I quilted is “Jacobean” by Willow Leaf Studios. First, a shout out to all of the Daytona Beach show go-ers!! GREAT to see so many at the show and appreciate my new and repeat customers! I had a great time talking about Hexies in the Learning Center. Thank you all for coming and your support!! I got a number of requests for videos of my tips….must put this on my to-do list…!! “Hex-a-ma-jig” and “Hex-a-ma-jig Jr.” are getting a lot of love. Did you know I have a “free pattern” on my website for “Two Halves Make a Whole Quilt”? The directions are geared for “Junior” and a “jelly roll” but by using larger, 3 1/2″ strips you can make the same quilt. Sew much fun! My friend Faye has been busy again using “Hex” and “Junior” (yes, easier to shorten their names <grin>!!). 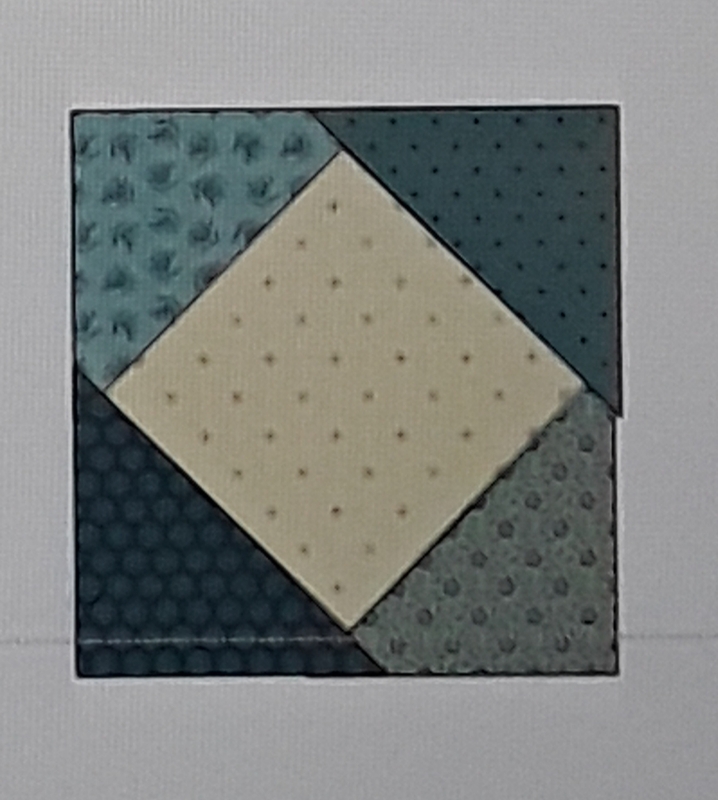 Here is the size difference for a braid style quilt adding a sashing strip between each half hexie shape. Hexie Braids by Faye P.!!! Love them! Thank you Faye!! A perfect technique to make a quick table runner. 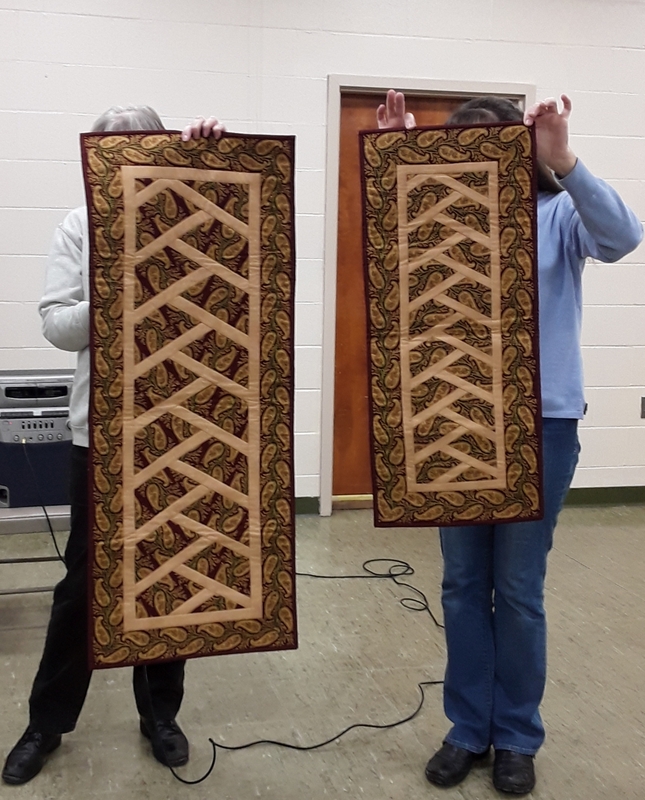 Have you ever made a braid quilt? Both Hexie tools and Brilliant Bindings can be used to create a braid. The free pattern for a Simple Braid using Brilliant Bindings is also on my website. Check it out! Since I’m a day behind, I’ll keep the tips short and sweet. 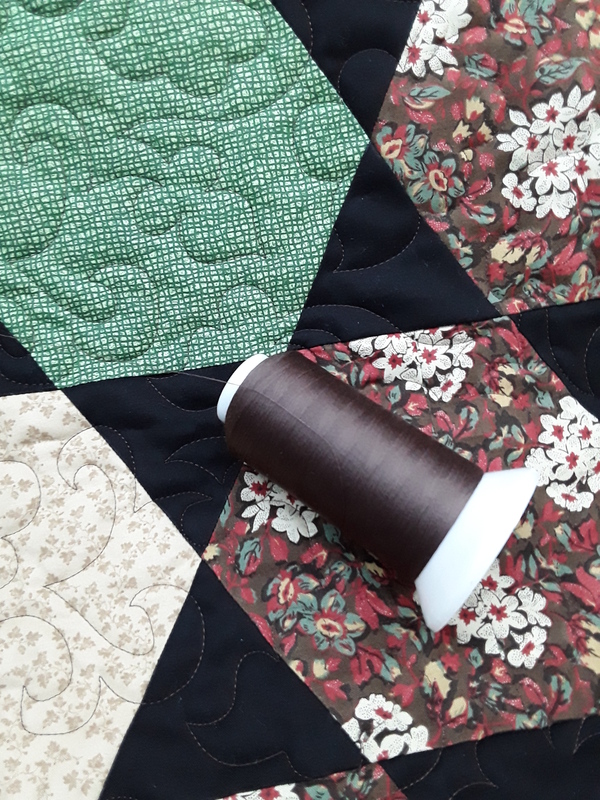 #1 – It is National Quilting Day on March 16th!! Plan to do something with your quilty friends! 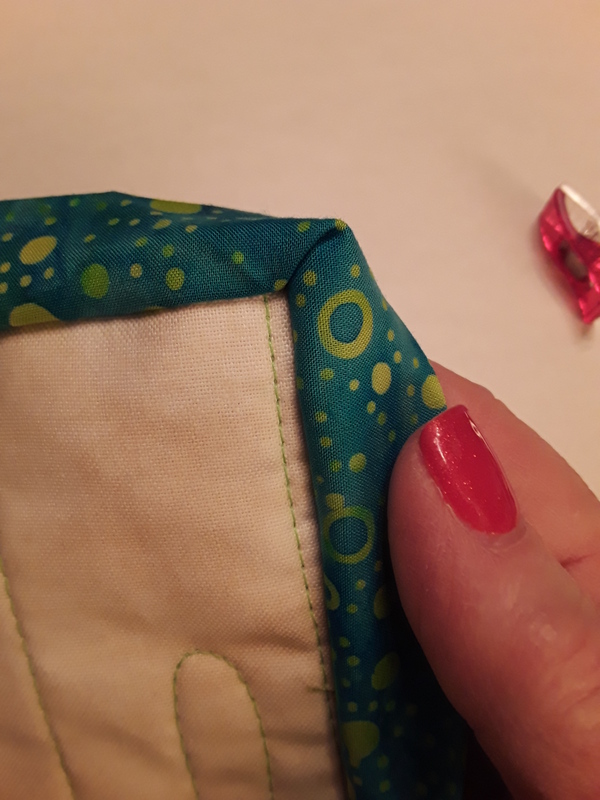 #2 – Chocolate…a day with sewing and quilting must include chocolate! Unless you are allergic….this I think it requires wine! And I just realized my tips are “sweet”, teehee! Soooo, below is the picture of my booth. 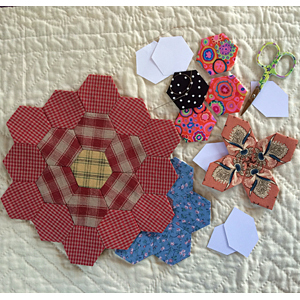 As you can see, I moved some quilts around and have Hexies (Hex-a-ma-jig and Hex-a-ma-jig Jr.!!) as the focus. In talking to many show go-ers, they love all sizes of Hexies and were excited about all the shapes and quilts that can be made with my tools. I did a learning center lecture! Thank you to those who went and came by the booth later!! I look forward to introducing more of you to Hex-a-ma-jig and “Junior”. “The Photographer” by Constanze Bötel, Neustadt am Rübenberge of Lower Saxony, Germany…Wow! So very realistic! This reminded me of my cousin’s Grandpa Croswhite. He loved photography and I was fascinated with his studio of slide, after slide, after slide! It actually took my breath away! 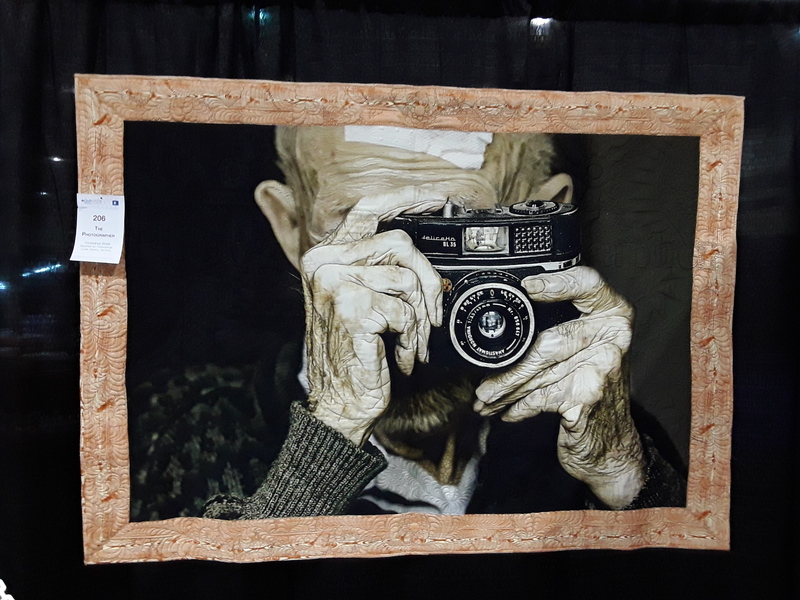 #1 – Credit all makers of quilts that you photo at a show or anywhere! 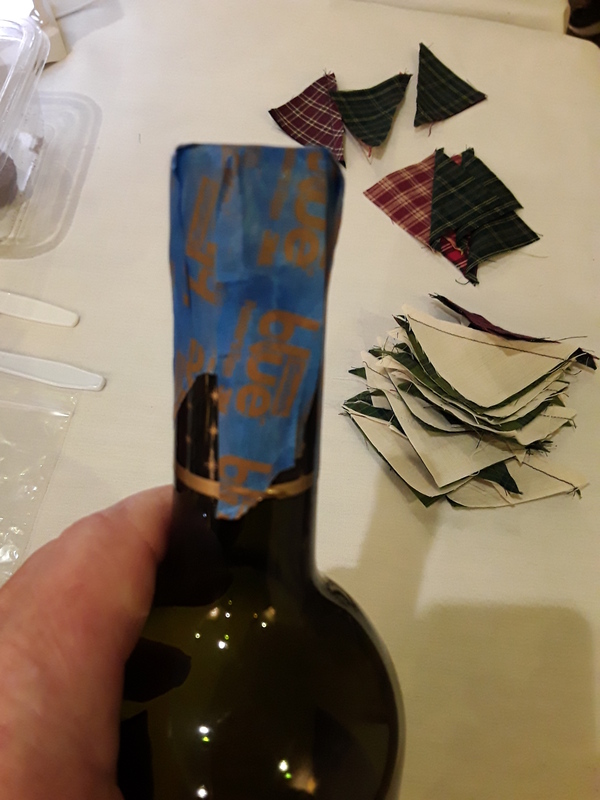 And just because #2 – When you loose the cork at a Getaway, painter’s tape will do! As the title suggests, I’m set up and ready for my first quilt show for vending in 2019! 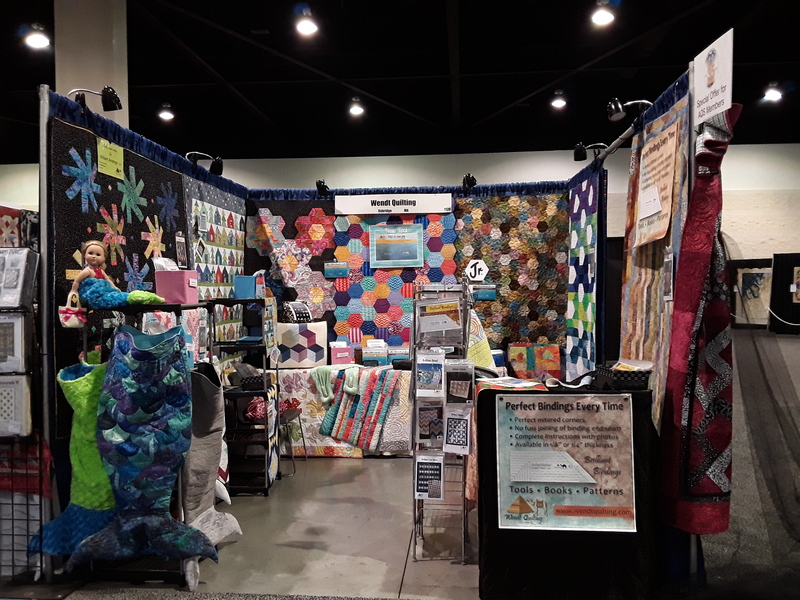 Hello AQS Quilt Week Daytona Beach!! I look forward to reconnecting with some of you and meeting quilters this week. I’ll be doing demos in my booth and a presentation in the learning center on Thursday at 2pm. I hope you will join me. I’ll be showing my new Hex-a-ma-jig and Junior! The booth has a bit of a different look with Hexies as the focus. Come by and say hi! I’ll post photos in the next couple days…ummm…can you guess…I forgot to take pictures today. So, more soon! #1 – Snacks…always snacks while you sew! But, don’t forget to was those hands before playing with your projects. You don’t want to get any food/grease/etc. on those georgeous fabrics! #2 – How do you shop at a show? Look for great kits, show specials and great vendors who have come from near and far to bring you the best the quilting world has to offer. If you are an AQS member I have an “I Am AQS” special just for you!